Justin and Patrick roll up their sleeves and wade into the flood waters to help Matt figure out what to do about his wet basement. 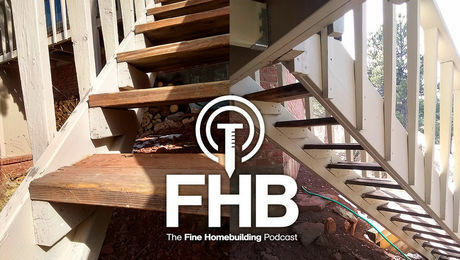 This, plus code interpretations when it comes to deck footings, and some help for a listener with rotten walls. Mike writes: My home in Pennsylvania is relatively new (only 9 years old), but we recently had a tile shower disaster in our master bathroom. I’ll spare you the litany of errors that where made during the initial installation, but the damage was quite extensive. When water started dripping through the downstairs ceiling my inner Justin Fink got the best of me, and I decided to completely gut the bathroom! Well, it was a good thing that I did. The subfloor under the shower was so badly compromised that I had to replace it. One of the interior shower walls needed to be rebuilt due to rot. Another one of the shower walls is actually an exterior wall, and this is where things started to get interesting. I noticed a musty smell coming from the fiberglass insulation, so I decided to peel it back to see what was going on only to find that the exterior sheathing was rotted. The interesting thing was that the top of the sheathing was more rotted than the bottom, so my hypothesis is that warm moist air from the shower was entering the wall cavity, rising, and eventually condensing on the cold sheathing in the winter months. I also noticed that there was some very slight moisture damage at the top of almost every stud bay in the bathroom. So, I replaced all of the paper faced fiberglass batts with un-faced batts and added Certainteed’s “Membrain” over the entire wall assembly as a vapor barrier. I used Schluter products for the shower wall and floor to make sure everything was water tight, and I’m in the process of installing a bigger bathroom fan to get the moisture out quickly. Other than taking shorter showers, can you think of anything else that I missed? It also occurred to me that had a product like Zip System been used on the exterior of my house this problem would have likely been even worse, so it seems like getting the details of the wall right, especially in the bathroom are crucial as houses become more and more air tight. Ken writes: I tore down and am rebuilding a small deck off my mudroom after having replaced the rim joist on the house because the previous deck builder didn’t properly flash when the deck was built 20+ years ago. The deck is small and low enough (9′ x 11′, 24″ high) to not require a permit per the county. The mudroom door is the main entrance we use throughout the day. Because of the way it is situated on my house, I have a few questions about the best way to proceed. The frost depth in our area (near Seattle, WA) calls for 18″ footings. But this deck is nestled in a U-shaped area between the dining room, mudroom and second floor roof of the basement-level garage. And the dining room and mudroom have basement below. So the foundation footings on all three sides are almost 8′ deep. If I understand correctly, the DCA 6 says the footings of the deck must be as deep as the footings of the house for any deck footings that are within 5′ of the house footing. Which will be all of them in my case. I had wanted to use footings instead of pier blocks like the previous deck had, but this seems like way too much digging. The DCA 6 does not mention piers. Will they still be the best way to go? What is the proper way to use them? Somewhere online I read that pier blocks still have to be buried (although the previous deck just had them floating at ground level). Having just replaced the mudroom rim joist, I would prefer to have the deck be built as non-ledger. The DCA 6 implies that non-ledger decks still should be connected to the house. Is that the case, or can I leave the frame an inch or so away from the wall on all sides? The dryer vent, laundry room fan, and basement bath fan all vent out through the joist on the dining room side, parallel to the deck joists. What is the best way to handle the vents under the deck? Thanks for the podcast and the magazine – I appreciate all I have learned. 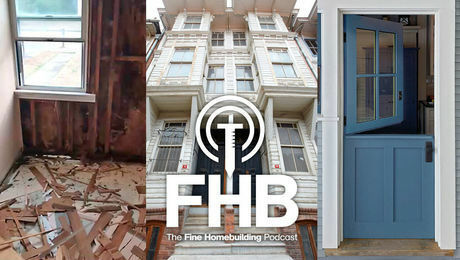 This episode of the podcast is brought to you by Benjamin Moore, Titebond, and Versetta Stone. 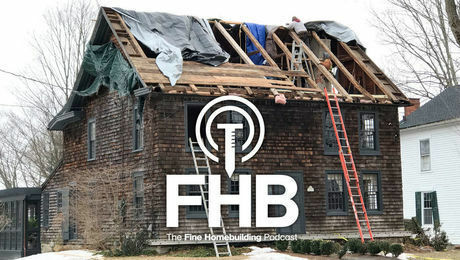 This episode of the Fine Homebuilding podcast is brought to you by Benjamin Moore. Everyone can paint. This is true. But not everyone can get the project done right. And Benjamin Moore knows that’s why you’re on the job. You’re more than a paintbrush and a ladder. Your client can buy those things at a hardware store, but they hired you for your skills and expertise. You know every paint job is different and that it takes more than one coat for the best finish. Benjamin Moore believes in doing things the right way. Because everyone can paint, but to do it right, it takes an expert contractor, it takes more than one coat and it takes Benjamin Moore. Paint like no other. Visit BenjaminMoore.com. 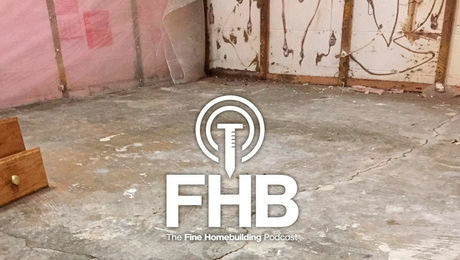 This episode of the Fine Homebuilding podcast is also brought to you by Titebond. Bonding heavy materials to vertical surfaces is a real challenge. 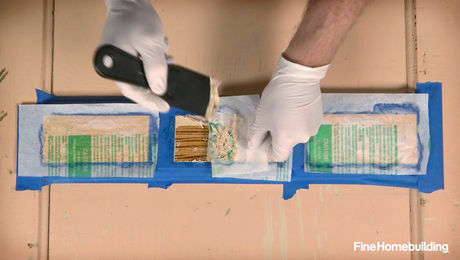 To meet that challenge, you need a durable adhesive with grabbing power you can trust. Titebond’s Ultimate TITEGRAB Adhesive has twice the vertical strength of most other adhesives, and is uniquely designed for bonding a wide variety of building materials, including, stone, brick, and concrete. TITEGRAB is ideal for indoor and outdoor applications, and is 100% waterproof. Available at building supply stores, lumber yards and home improvement stores. Visit TITEBOND.COM for more details. 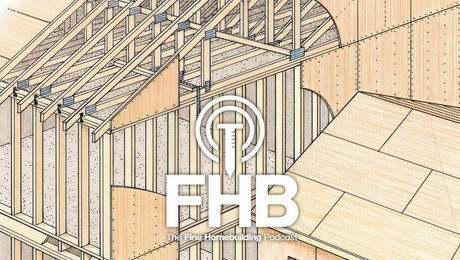 This episode of the Fine Homebuilding podcast is also brought to you by Versetta Stone. Re-creating the beauty of stone starts by creating a revolutionary product. Versetta Stone is a one-of-a-kind, mortarless, cement-based stone veneer that installs with screws or nails. This unique panelized design allows contractors ease of installation, saving time and money without sacrificing beauty. Accomplish exactly what your customers are looking for with Versetta Stone. 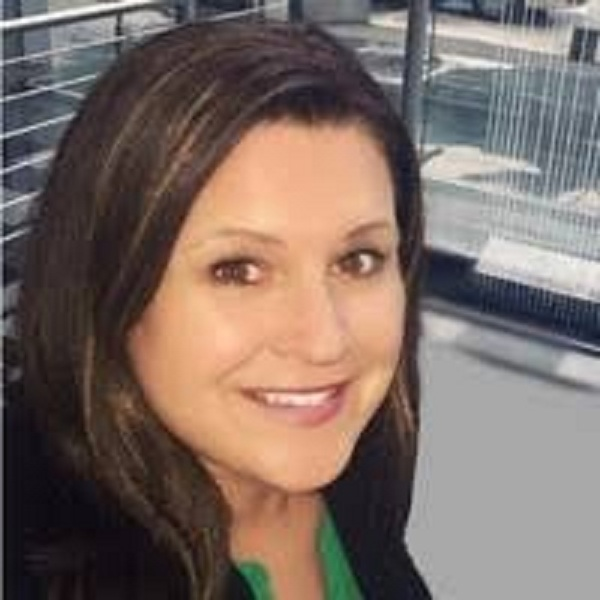 To learn more about Versetta Stone, visit VersettaStone.com. These fixtures save space and make your bathroom easier to clean, but installation demands a different workflow. 9 steps to install quiet, well-connected ABS and PVC piping.